Striker Likers: Strikers Win At Home! So we here at Striker Likers have got a little caught up in all the excitement around town. 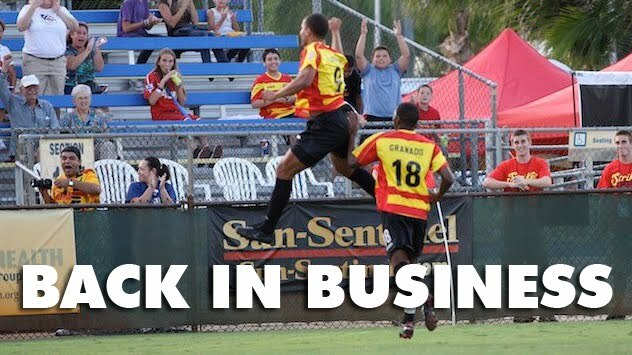 The NBA Finals, the Stanley Cup Finals, International Friendlies, EuroCup Qualifiers, the Gold Cup; we've gotten so accustomed to looking elsewhere for our football (and sports action in general), we almost (just almost) overlooked the magic that happened this past weekend at the Fort (aka Lockhart Stadium). A stunning 3-2 victory over the defending champs Puerto Rico Islanders and the triumphant return of forward phenom Abe Thompson. Abe scored the game's first goal and is a welcome return to a team that hasn't found the back of the net in the past two games. So the Strikers are officially back, with a home win over a quality opponent no less. So take notice South Florida! The win was in jeopardy and it took a late flurry from our Strikers to pull it out and the receptive crowd of roughly 5,000 were well entertained. If only we could play Tampa now. So although you may be glued to your TV sets watching the Heat take on the Mavs or the US making a run at Gold Cup glory, always remember you've got a team here too that needs your love.